Creative Universe and Ci2012 are proud to support Creativity Australia. Creativity Australia is a not-for-profit organisation that inspires people to find their voice. 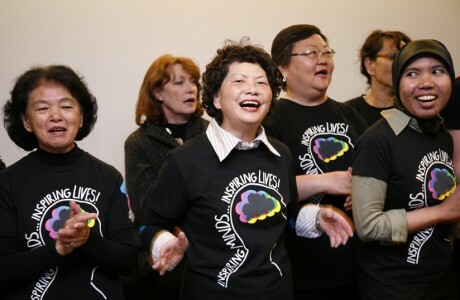 Creativity Australia’s acclaimed With One Voice choir social inclusion and community wellbeing programs aim to recognise each unique voice. The choir programs are unique in that they deliberately build and bridge social capital. They bring together people of all ages and from all walks of life, cutting across socioeconomic, cultural, religious, generational and linguistic barriers in the pursuit of harmony. In just over three years fifteen With One Voice choir programs have been developed involving hundreds of participants in Victoria, NSW and ACT. These diversity choirs have in turn reached out to thousands of people with their moving stories and inspirational performances. Creativity Australia is now developing a “HOW TO GUIDE”, online gateway, major research project and a national distribution plan to enable communities from all over Australia and internationally to develop and experience the benefits of these innovative social inclusion programs.